If you are attending any party or event this easter this is the perfect gift to bring to the hostess/host. Cia gave me this idea. She always saves her tin cans from the kitchen. “They are perfect for planting” she tells me. And even though they are pretty just the way they are, this time of year a bit of colour is always welcome. 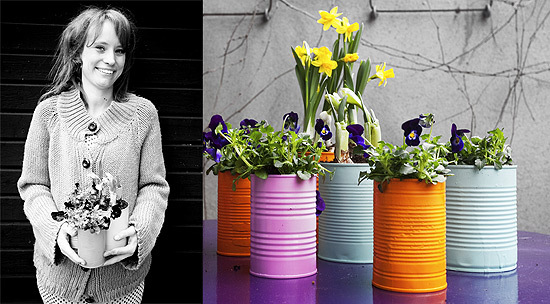 She spray painted these in bright colors, and once they had dried she planted some spring flowers in them. Gosh I love Cia´s purple table. Don´t forget to make draining holes in the bottom. Such a nice color comibination! Beautiful! Sharing on my blog. 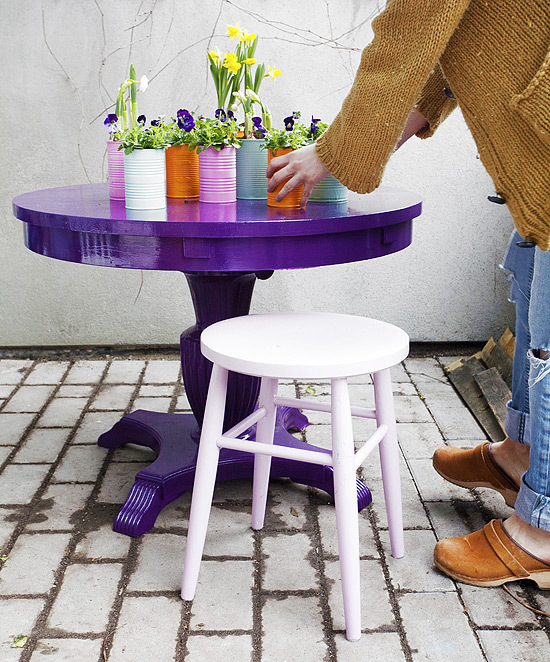 And I really love the purple painted table! Adding that to my blog and also to my “decorating” file! Thanks! Thank you for sharing this lovely project, I ´ll try myself this week! 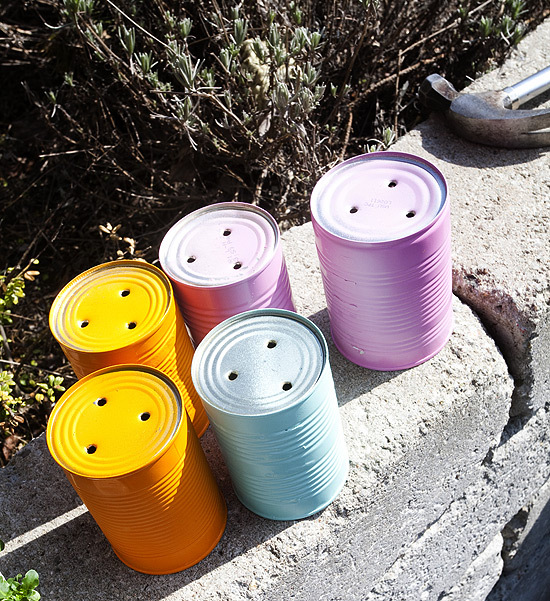 Just saw the lovely tin can photos on Pinterest. What a charming project! Thanks so much for sharing! Thanks for sharing. I think I may even make some of these for my backyard! Thank you for this idea! I am going to use it to plant small windowsill herb garden from rootings of my herbs that will soon die back and give away as gifts! Wonderful idea!!! I’m going to spray the tins ready to plant to plants before I go to friends for meals. Love this. Thanks for sharing. Love this and will be featuring it in a craft section on my blog! Nice work! what type of paint ? 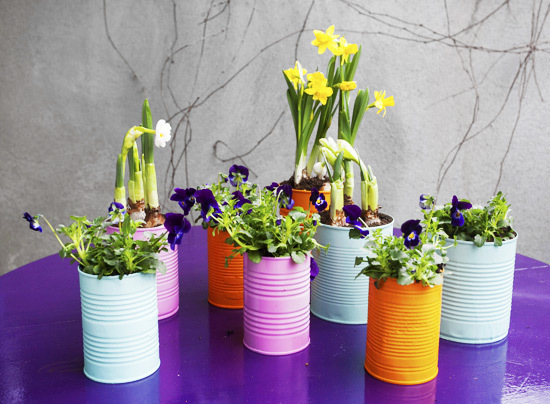 5 Springtime DIY Projects | DIY: How does it work? 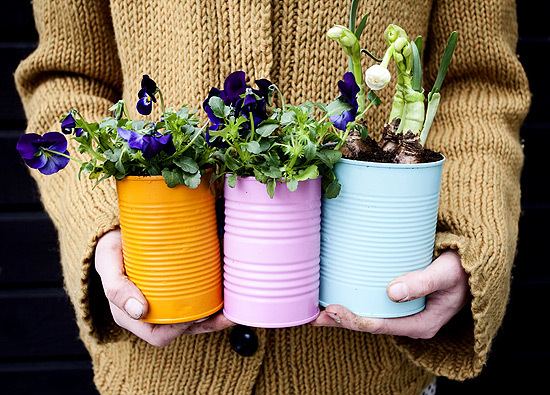 This is a very good idea.I also try this to make my garden colour full.Keep sharing such fabulous ideas. This is a very good idea.I also try this to make my garden colour full.Keep sharing such fabulous ideas.I really love this. Creare una fioriera originale riciclando! 18 idee… Ispiratevi!! !